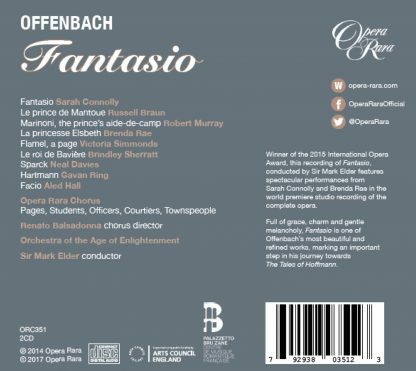 Opera Rara’s new release is the first complete studio recording of Fantasio, one of Offenbach’s most beautiful and refined works. A heady cocktail of charm, gracefulness and gentle melancholy, of bad-tempered jokes and poetry, Fantasio, marks the crucial step in Offenbach’s path towards The Tales of Hoffmann. 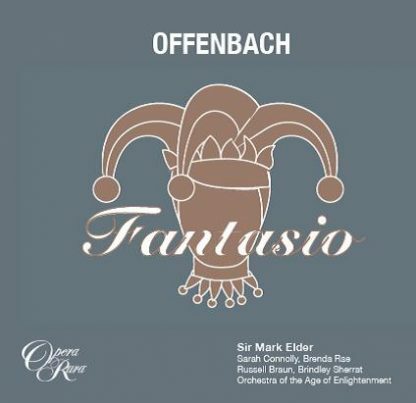 Experience one of Offenbach’s most beautiful and refined works with spectacular performances from Sarah Connolly and the outstanding young American soprano, Brenda Rae. Fantasio is a heady cocktail of charm, gracefulness and gentle melancholy, of bad-tempered jokes and poetry, marking the crucial step in Offenbach’s path towards The Tales of Hoffmann. This recording was made using the new critical edition made by Jean-Christophe Keck for Boosey & Hawks Offenbach Edition Keck series. Click here for the video of Sarah Connolly (Fantasio) and Brenda Rae (Elsbeth) in their duet ‘Quel murrmure charmant’ filmed at the Fantasio recording launch. Hugh Canning awards Fantasio Classical Album of the Week in the Sunday Times (Sunday, 5 October 2014). Opera Rara’s Fantasio recording won the 2015 International Opera Awards for best CD (Complete Opera). This release includes a 28-page booklet with the introductory article and synopsis in English. The libretto in original French with the English translation is available to download in PDF format here. 02 Fantasio: Vive le roi! 05 Fantsaio: Vive le roi! Vive le Roi! 06 Fantasio: Où diable est donc Fantasio? 11 Fantasio: Quel astre contemples-tu là? 15 Fantasio: Je médite un projet d’importance! 21 Fantasio: Oui, c’est bien lui, chère princesse! 24 Fantasio: Aurait-elle un coeur dur et faux? 32 Fantasio: Par Jupiter! Je l’avais bien prédit! 40 Fantasio: Oui, oui, je connais ton dévouement! 42 Fantasio: Eh! Bien! Le voilà, Fantasio! The action takes place on a square in Munich. On one side of the stage are the gates and terrace of the royal palace; on the other, a tavern and a tailor’s shop. Dusk is falling. The town is in festive mood. The crowd has gathered to celebrate peace, soon to be sealed by the forthcoming marriage of the Prince of Mantua to the Princess of Bavaria. Three students, Sparck, Hartmann and Facio, enjoy the party and poke fun at the bourgeoisie. [N° 1 chorus and couplets “Long Live the King”]. The king, with his attendants, appears from the palace to announce the arrival of the Prince of Mantua and the marriage of his daughter Elsbeth [N° 1b end of “Long Live the King”]. Rutten, the king’s secretary, tells the sovereign that his daughter Elsbeth is mourning the death of Saint-Jean, the court jester whom she adored. Enter an odd-looking figure, Marinoni, the Prince of Mantua’s aide. He has come to keep a discreet eye on the preparations for the festivities and find out what the locals are thinking. He moves away when Fantasio appears, lost in thought. In a melancholy mood with no wish at all to join the celebrations, he improvises up a ballad to the moon [N° 2 ballad, “See in the Dark Night”]. Flamel the page arrives to ask the students to keep their voices down so as not to disturb the Princess who wanders on to the terrace, also deep in thought. Elsbeth sings of her confusion at feelings she is experiencing for the first time and which are gradually taking her over [N° 3 recitative and ballad [“Look, the Whole Town is Celebrating”]. Fantasio, spellbound by her angelic voice, responds to her melancholy song with a ballad of his own, so that the two young people sing a duet without having seen one another [N° 4 duet “What Sudden Delightful Murmuring”]. A maidservant comes to fetch the Princess. Meanwhile, the student Sparck tries to drag Fantasio to join in the dance. But suddenly the court jester Saint-Jean’s sombre funeral procession moves across the square. It then occurs to Fantasio to disguise himself as the late jester so that he can approach the Princess [N° 5 penitents’ chorus “Oh, St. Jean”]. He goes with Sparck to the nearby tailor’s shop to get the costume, which will also help him escape his creditors and avoid a prison sentence. The Prince of Mantua enters, accompanied by Marinoni. To try to discover his future bride’s true feelings, the Prince decides to exchange clothes with his aide [“I’m Working Out an Important Plan!”]. The students return and Sparck sings a final homage to Saint-Jean and to fools in general. They are all waiting for Fantasio but are dumbstruck when he appears, believing the king’s jester has risen from the dead. The merry group leave and Fantasio stands alone, knocking at the palace door [N° 7 finale” All Noises Cease”]. The curtain rises on Elsbeth, her page Flamel, and several ladies of the court strolling in the palace gardens. The Princess prefers to remember her beloved jester than to think about her future marriage [N° 9 chorus and aria “When the Tree’s Shade”]. The arrival of the Prince of Mantua is announced [N° 10 quintet “It’s Really Him”]. The king enters with the Prince and Marinoni, disguised as each other. The Prince’s first encounter with Elsbeth is not a success. Marinoni does not know how someone of his new-found status should behave, and the Prince’s attempted hoax makes matters worse. Left alone, the Prince is riddled with self-doubt. [N° 11 ballad “I Shall Never Be Loved for Myself”]. But he is not about to give up and prepares to launch a fresh campaign. Returning to the palace gardens, Fantasio finally comes across Elsbeth. At first, the Princess takes offence at this “scholar in fool’s clothing” who dares to disguise himself as poor Saint-Jean. But Fantasio intrigues her and makes her laugh at the silly things he says [N° 12 couplets “It’s the King’s New Jester”]. He even manages to touch the young lady’s heart and to listen as she tells him her troubles. [N° 13 “So That’s All I Have To Comfort My Heart”]. Before he leaves, Fantasio promises the Princess that this marriage of convenience will not take place. Flamel enters and tells Elsbeth that “the Prince is not the Prince”. But the entire court has already appeared onstage. While Marinoni (disguised as the Prince) enters, accompanied by the Prince (disguised as his aide), and pays his respects to Elsbeth, to the cheers of the crowd, Fantasio climbs up a tree and, with a stick, suddenly sends the false Prince’s wig flying through the air, making him look a complete fool. After such an insult the marriage cannot possibly take place and Fantasio is marched off to gaol [N° 14 finale “Today the Court is in Festive Mood”]. Fantasio is delighted to have ruined the Prince’s wedding plans, but is nevertheless languishing in gaol. While he pretends to be asleep, Elsbeth comes to visit him [N° 16 romance “Poor Careless Psyche”]. She tells her new jester that his bravery was in vain as she is to marry the Prince of Mantua to ensure peace between the two kingdoms. Fantasio suddenly removes his disguise and reprises the ballad he sung in Act 1. Deeply moved, Elsbeth believes him to be the real Prince of Mantua and is ready to offer herself to him. But Fantasio reveals his true identity: Fantasio, an ordinary middle-class man from Munich who has fallen in love [N° 17 duet, “There is Only One Song to Sing”]. Elsbeth gives him her key to her garden and helps him escape. Since it was a hunchbacked jester and not a charming young man that the Swiss Guards believed they were keeping under lock and key, he is free to walk away accompanied by the Princess. [N° 18 Melodrama – 2nd Intermezzo tableau]. The second scene takes place in the same setting as Act 1. Still blind with rage, the Prince prepares to enter the royal palace to confess his trickery to the King of Bavaria and order Marinoni to return his princely clothes [N° 19 couplets [“Take Back This Coat, My Prince”]. Fantasio, dressed as a student once again, tries to calm his angry friends who were preparing to free him from prison [N° 20 ensemble “They Have Gone Into the Palace”]. Meanwhile, the King of Bavaria and the Prince of Mantua are about to declare war. Fantasio, crowned “king of fools” by the students, pleads for peace and challenges the Prince to a duel to settle the quarrel there and then. But the Prince withdraws, decides not to marry Elsbeth and returns to Mantua. The King pardons Fantasio, whom he names Prince for preventing war. Fantasio offers to hand back to Elsbeth the key to the gardens which she gave him in prison, but she asks him to keep it [N° 21 finale “Everyone is Rallying to Your Banner”]. Die Opéra comique spielt auf einem Platz in München. Auf der einen Seite der Bühne sind die Tore und die Terrasse der königlichen Residenz zu sehen, auf der anderen eine Gastwirtschaft und ein Schneiderladen. Der Abend bricht herein, in der Stadt herrscht eine festliche Stimmung. Menschen haben sich versammelt, um den Frieden zu feiern, der durch die bevorstehende Hochzeit zwischen dem Prinzen von Mantua und der Prinzessin von Bayern besiegelt werden soll. Die drei Studenten Sparck, Hartmann und Facio nehmen ausgelassen an den Festivitäten teil und machen sich über die Bourgeoisie lustig. [Nr. 1, Chor und Couplets, „Vive le roi“]. Der König verlässt mit seinem Gefolge die Residenz, um die Ankunft des Prinzen von Mantua und die Hochzeit seiner Tochter Elsbeth zu verkünden [Nr. 1b, Ende von „Vive le roi“]. Rutten, der Sekretär des Königs, berichtet dem Herrscher, dass seine Tochter Elsbeth um Saint-Jeans trauert, den von ihr über alles geliebten Hofnarren. In dem Moment tritt eine seltsam aussehende Gestalt hinzu: Es ist Marinoni, der Adjutant des Prinzen von Mantua. Er möchte die Vorbereitungen für die Festlichkeiten im Auge behalten und gleichzeitig erfahren, was in der Bevölkerung vorgeht. Aber er zieht sich zurück, als Fantasio erscheint, ganz in Gedanken versunken. In melancholischer Stimmung will er nicht an den Feierlichkeiten teilnehmen und improvisiert eine Ballade an den Mond [Nr. 2, Ballade, „Voyez dans la nuit brune“]. Die Zofe Flamel kommt hinzu und bittet die Studenten um etwas Zurückhaltung, um nicht die Prinzessin zu stören, die sich ebenfalls in Gedanken versunken auf der Terrasse ergeht. Elsbeth singt von den verwirrenden Gefühlen, die sie zum ersten Mal erlebt und die sie zu überwältigen drohen [Nr. 3, Rezitativ und Ballade, „Voilà toute la ville en fête“]. 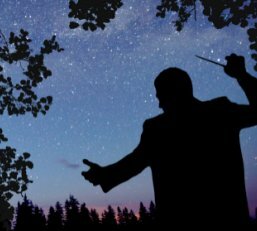 Gebannt von ihrer engelsgleichen Stimme beantwortet Fantasio ihr melancholisches Lied mit einer eigenen Ballade, und so singen die beiden jungen Menschen ein Duett, ohne sich zu sehen [Nr. 4, Duett, „Quel murmure charmant“]. Eine Zofe erscheint, um die Prinzessin abzuholen. Unterdessen versucht Sparck, einer der Studenten, Fantasio zum Tanzen zu überreden. Unvermittelt zieht die Trauerprozession für den Hofnarren Saint-Jean über den Platz. Da verfällt Fantasio auf die Idee, sich als der gerade verstorbene Narr zu verkleiden und sich als solcher der Prinzessin zu nähern [Nr. 5, Chor der Büßer, „O Saint-Jean“]. Zusammen mit Sparck geht er in den nahegelegenen Schneiderladen, um sich ein Kostüm zu besorgen; das soll ihm auch helfen, seinen Gläubigern zu entkommen und einer Gefängnisstrafe zu entgehen. Der Prinz von Mantua in Begleitung Marinonis tritt auf. Um die wahren Gefühle seiner Braut zu erfahren, beschließt der Prinz, mit seinem Adjutanten die Kleider zu tauschen [Nr. 6, Duett „Je médite un projet d’importance“]. Die Studenten kehren zurück, Sparck singt eine letzte Hommage an Saint-Jean und an die Narren im Allgemeinen. Alle warten auf Fantasio, doch als er tatsächlich erscheint, verschlägt es ihnen die Sprache, denn sie halten ihn tatsächlich für den von den Toten auferstandenen Hofnarren. Die fröhliche Schar tritt ab, und Fantasio bleibt alleine zurück, um an der Pforte der Residenz zu klopfen [Nr. 7, Finale, „Tout bruit cesse“]. Als sich der Vorhang hebt, ergeht sich Elsbeth mit Flamel und mehreren Hofdamen im Residenzgarten. Die Prinzessin denkt lieber an ihren geliebten Hofnarren als an die bevorstehende Hochzeit [Nr. 9, Chor und Arie, „Quand l’ombre des arbres“]. Die Ankunft des Prinzen von Mantua wird angekündigt [Nr. 10, Quintett, „Oui, c’est bien lui, chère princesse“]. Der König tritt zusammen mit dem Prinzen und Marinoni auf, welche die Kleider getauscht haben. Die erste Begegnung des Prinzen mit Elsbeth ist wenig verheißungsvoll. Marinoni weiß nicht, wie sich ein Mann des Standes, den er gerade erst bekommen hat, zu verhalten hat, und der versuchte Scherz des Prinzen macht die Sache nur noch schlimmer. Als dieser alleine zurückbleibt, gibt er sich Selbstzweifeln hin [Nr. 11, Ballade, „Je ne serai jamais aimé pour moi-même“]. Doch aufzugeben ist er nicht bereit, und so plant er eine neue Mission. In der Zwischenzeit kehrt Fantasio in den Residenzgarten zurück und begegnet schließlich Elsbeth. Zunächst ist sie empört über diesen Studiosus im Narrenkostüm, der es wagt, sich als der arme Saint-Jean auszugeben. Doch dann ist sie gefesselt von Fantasio und seinen geistreichen Bemerkungen, mit denen er sie zum Lachen bringt [Nr. 12, Couplets, „C’est le nouveau bouffon du roi“]. Es gelingt ihm sogar, das Herz der Prinzessin zu rühren, und er hört ihr zu, als sie ihm von ihrem Kummer berichtet [Nr. 13, Duett, „Je n’ai donc rien de plus pour consoler mon cœur“]. Bevor er geht, verspricht er ihr, dass ihre Zweckehe mit dem Prinzen nicht geschlossen werden wird. Flamel tritt ein und berichtet Elsbeth, dass „der Prinz nicht der Prinz“ ist, doch mittlerweile hat sich bereits der gesamte Hofstaat auf der Bühne versammelt. Während Marinoni (verkleidet als der Prinz) in der Begleitung des Prinzen (verkleidet als sein Adjutant) erscheint und der Prinzessin zum Jubel der Menge die Ehre erweist, steigt Fantasio auf einen Baum, nimmt einen Stock und lässt die Perücke des falschen Prinzen unvermittelt durch die Luft fliegen, so dass dieser wie ein Tor dasteht. Nach einem derartigen Affront kann die Ehe natürlich nicht geschlossen werden, Fantasio wird ins Gefängnis gebracht [Nr. 14, Finale, „C’est aujourd’hui fête à la cour“]. Fantasio ist überglücklich, die Hochzeit der Prinzessin vereitelt zu haben, dennoch: Er sitzt im Gefängnis. Während er vorgibt zu schlafen, besucht Elsbeth ihn [Nr. 16, Ballett, „Psyché, pauvre imprudente“]. Sie berichtet ihrem neuen Narren, dass seine wackere Tat vergebens war, denn sie müsse den Prinzen von Mantua ehelichen, um den Frieden zwischen den beiden Königreichen sicherzustellen. Unvermittelt zieht er seine Verkleidung aus und singt die Ballade, die er bereits im 1. Akt sang. Zutiefst bewegt hält Elsbeth ihn für den wahren Prinzen von Mantua und ist bereit, ihn zu heiraten. Doch nun gibt Fantasio seine wahre Identität zu erkennen: ein ganz gewöhnlicher Münchner Bürger, der sich in sie verliebt hat [Nr. 17, Duett, „Il n’est qu’un refrain à chanter“]. Elsbeth überreicht ihm den Schlüssel zu ihrem Garten und hilft ihm bei der Flucht: Da die Schweizer Garden glaubten, einen buckligen Narren als Gefangenen zu bewachen und keinen charmanten jungen Mann, kann er in Begleitung der Prinzessin zum Gefängnis hinausmarschieren [Nr. 18, melodramatisches Intermezzo]. Die 2. Szene findet vor derselben Kulisse statt wie der 1. Akt. In blinder Wut will der Prinz die Residenz aufsuchen, um dem König von Bayern sein Täuschungsmanöver zu gestehen und Marinoni zu befehlen, seine fürstlichen Kleider auszuziehen [Nr. 19, Couplet, „Reprenez cet habit mon prince“]. Fantasio, jetzt wieder in seiner Person als Student, versucht, seine aufgebrachten Freunde zu beschwichtigen, die drauf und dran waren, ihn aus dem Gefängnis zu befreien [Nr. 20, Rezitativ und Chor, „Ils sont entrés dans le palais“]. Unterdessen stehen der König von Bayern und der Prinz von Mantua kurz davor, sich gegenseitig den Krieg zu erklären. Fantasio, der von den Studenten zum „König der Narren“ erhoben wurde, bittet um Frieden und fordert den Prinzen zu einem Duell heraus, um den Streit unverzüglich aus dem Weg zu räumen. Doch der Prinz lehnt ab, verzichtet auf die Hochzeit mit Elsbeth und kehrt nach Mantua zurück. Der König begnadigt Fantasio und erhebt ihn zum Prinzen für sein Verdienst, den Krieg verhindert zu haben. Fantasio will Elsbeth den Schlüssel zu den Gärten zurückgeben, den sie ihm im Gefängnis gab, doch sie bittet ihn, den Schlüssel zu behalten [Nr. 21, Finale, „Sous ta bannière on se rallie“]. La vicenda si svolge in una piazza di Monaco. Su un lato del palcoscenico si trovano le porte e la terrazza del palazzo reale, sull’altro un’osteria e la bottega di un sarto. Scende la sera e la città è in festa. La folla si è radunata per festeggiare le nozze tra il principe di Mantova e la principessa di Baviera, che garantiranno la pace tra i loro due Paesi. Tre studenti, Sparck, Hartmann e Facio, si divertono a prendersi gioco della borghesia. [N° 1 coro e versi Vive le roi [Viva il re]]. Dal palazzo arrivano il re e i suoi assistenti che annunciano l’arrivo del principe di Mantova e il matrimonio della principessa Elsbeth [N° 1b fine di “Vive le roi”]. Rutten, segretario del re, comunica al sovrano che sua figlia Elsbeth è in lutto per la morte di Saint-Jean, il buffone di corte a cui era molto affezionata. Entra un personaggio dall’aspetto strano, Marinoni, assistente del principe di Mantova, venuto a sorvegliare i preparativi per la festa e a sondare lo stato d’animo del popolo. Quando si allontana entra Fantasio, tutto preso da pensieri malinconici. Non ha alcun desiderio di unirsi ai festeggiamenti e improvvisa una ballata alla luna [N° 2 ballata Voyez dans la nuit brune [Ecco nella notte scura]]. Arriva il paggio Flamel e chiede agli studenti di non disturbare la principessa che si aggira sulla terrazza, anche lei immersa nei suoi pensieri. Elsbeth descrive la confusione legata ai sentimenti che prova per la prima volta e che gradualmente la sopraffanno [N° 3 recitativo e ballata Voilà toute la ville en fête [Tutta la città è in festa]]. Affascinato dalla sua voce angelica, Fantasio risponde alla malinconica melodia con la sua ballata e i due giovani finiscono per cantare, senza vedersi, un duetto [N° 4 duetto Quel murmure charmant [Affascinante mormorio]]. La principessa si allontana, chiamata da una domestica, e lo studente Sparck prova a convincere Fantasio a partecipare alla danza. Ma all’improvviso la piazza viene attraversata dalla tetra processione funebre del buffone di corte Saint-Jean e a Fantasio viene l’idea di travestirsi per assumere le sembianze del defunto e avvicinarsi così alla principessa [N° 5 coro di penitenti O Saint-Jean]. Il giovane accompagnato da Sparck si reca nella bottega del sarto per procurarsi un costume: quest’ultimo lo aiuterà anche a sfuggire ai creditori ed evitare di finire in galera. Entra il principe di Mantova, accompagnato da Marinoni. Per scoprire i veri sentimenti della futura sposa, il principe decide di scambiare i propri abiti con quelli del suo assistente [N° 6 duetto Je médite un projet d’importance [Preparo un piano importante]]. Ritornano gli studenti e Sparck canta un omaggio finale a Saint-Jean e ai buffoni in generale. Tutti sono in attesa di Fantasio, ma la sua apparizione li lascia senza parole: tutti pensano che si tratti del giullare del re ritornato dai morti. L’allegro gruppo esce, Fantasio rimane solo e bussa alla porta del palazzo [N° 7 finale Tout bruit cesse [Cessa ogni rumore]. Elsbeth, il suo paggio Flamel e alcune signore della corte passeggiano nei giardini del palazzo. La principessa preferisce ricordare il suo giullare preferito piuttosto che pensare alle imminenti nozze [N° 9 coro e aria Quand l’ombre des arbres [Quando l’ombra degli alberi]]. Viene annunciato l’arrivo del principe di Mantova [N° 10 quintetto Oui, c’est bien lui, chère princesse [È proprio lui, cara principessa]]. Entra il re accompagnato dal principe e da Marinoni che si sono scambiati le vesti. Il primo incontro tra il principe ed Elsbeth è un disastro. Marinoni non sa come comportarsi nel ruolo che dovrebbe interpretare e lo stratagemma del principe peggiora le cose. Rimasto solo, il principe è assalito da dubbi e incertezze. [N° 11 ballata Je ne serai jamais aimé pour moi-même [Non sarò mai amato per me stesso]]. Ma non intende darsi per vinto e si prepara a ritornare alla carica. Di ritorno nei giardini del palazzo, Fantasio finalmente incontra Elsbeth. Inizialmente la principessa reagisce male davanti allo “studioso in abiti da giullare” che ha osato travestirsi con i panni del povero Saint-Jean. Ma Fantasio la incuriosisce e riesce a farla ridere [N° 12 distici C’est le nouveau bouffon du roi [È il nuovo buffone del re]]. Riesce persino a commuoverla e ascoltarla quando lei gli rivela i suoi problemi. [N° 13 duetto Je n’ai donc rien de plus pour consoler mon cœur [Non ho nient’altro per consolare il mio cuore]]. Prima di andar via, Fantasio promette alla principessa che il suo matrimonio di convenienza non si farà. Entra Flamel e rivela a Elsbeth che “il principe non è il principe”. Ma l’intera corte è già entrata sulla scena. Entra Marinoni (travestito da principe), accompagnato dal principe (nei panni del suo assistente), e porge i suoi omaggi a Elsbeth, tra le esclamazioni della folla. Fantasio si arrampica su un albero e, con un bastone, fa saltare in aria la parrucca del falso principe, ricoprendolo di ridicolo. Si tratta di un grave affronto: il matrimonio non può aver luogo e Fantasio viene accompagnato in cella [N° 14 finale C’est aujourd’hui fête à la cour [Oggi è giorno di festa a Corte]]. Fantasio è lieto di aver mandato a monte i piani matrimoniali del principe, ma rimane comunque in cella. Mentre finge di essere assopito, arriva Elsbeth a fargli visita [N° 16 balletto Psyché, pauvre imprudente [Psiche, povera sventata]]. La principessa comunica al nuovo giullare che il suo coraggio è stato vano e lei dovrà comunque sposare il principe di Mantova per mantenere la pace tra i due regni. Fantasio all’improvviso si toglie il costume e intona nuovamente la ballata che aveva cantato nell’Atto I. Profondamente commossa, Elsbeth si convince che sia lui il vero principe di Mantova ed è pronta a offrirsi a lui. Ma Fantasio le rivela la sua vera identità: è un borghese di Monaco che si è innamorato [N° 17 duetto, Il n’est qu’un refrain à chanter [È solo un ritornello]]. Elsbeth gli consegna la chiave del suo giardino e l’aiuta a fuggire. Dal momento che le guardie svizzere erano convinte di avere in cella un buffone gobbo e non un bel giovane, è facile per lui allontanarsi accompagnato dalla principessa [N° 18 intermezzo melodrammatico]. La Scena 2 si svolge nella stessa ambientazione dell’Atto I. Sempre accecato dall’ira, il principe si prepara a entrare nel palazzo reale per confessare il suo stratagemma al re di Baviera e ordinare a Marinoni di restituire gli abiti principeschi [N° 19 distico Reprenez cet habit mon prince [Riprendete quest’abito, principe]]. Rientrato nei panni dello studente, Fantasio cerca di calmare i suoi amici furibondi che si stavano preparando a liberarlo dalla prigione [N° 20 recitativo e coro Ils sont entrés dans le palais [Sono entrati nel palazzo]]. Nel frattempo, il re di Baviera e il principe di Mantova stanno per dichiararsi guerra. Fantasio, incoronato “re dei giullari” dagli studenti, sostiene la causa della pace e sfida il principe a duello per risolvere la disputa seduta stante. Ma il principe non accetta, rifiuta di sposare Elsbeth e ritorna a Mantova. Il Re perdona Fantasio e lo nomina principe per aver impedito la guerra. Fantasio offre a Elsbeth di restituirle la chiave del giardino che aveva ricevuto da lei in prigione, ma la principessa gli chiede di tenerla [N° 21 finale Sous ta bannière on se rallie [Ci riuniamo sotto la tua bandiera]. [Ouverture] L’action se situe à Munich, sur une place publique. D’un côté de la scène, les portes du palais royal et sa terrasse ; de l’autre, une taverne et une boutique de tailleur. C’est le crépuscule. La ville est en liesse. La foule rassemblée célèbre la paix bientôt scellée par le mariage imminent du prince de Mantoue et la princesse de Bavière. Quelques étudiants, Sparck, Hartmann et Facio, profitent de la fête tout en méprisant les bourgeois. [N° 1 chœur et couplets « Vive le roi »]. Le roi et ses gardes sortent du palais afin d’annoncer au peuple l’arrivée du prince de Mantoue et le mariage de sa fille Elsbeth [N° 1 bis sortie « Vie le roi »]. Rutten, le secrétaire du roi, explique au souverain que sa fille Elsbeth pleure la mort de Saint-Jean, le bouffon de la cour qu’elle adorait. Passe un curieux personnage, Marinoni, aide de camp du prince de Mantoue. Il est venu discrètement surveiller les préparatifs de la fête et sonder l’opinion. Il s’éloigne lorsque paraît Fantasio perdu dans ses pensées. Loin de vouloir participer à la fête, et dévoré par le spleen, il improvise une ballade à la lune [N° 2 ballade « Voyez dans la nuit brune »]. Le page Flamel vient demander aux joyeux potaches de parler plus bas afin de ne pas déranger la méditation de la princesse qui paraît sur la terrasse. Elsbeth chante son trouble face aux nouveaux sentiments qui gagnent peu à peu son cœur de jeune femme [N° 3 récit et romance « Voilà toute la ville en fête »]. Fantasio tombe sous le charme de cette voix angélique et répond à cette cantilène par une romance que les deux jeunes gens vont reprendre en duo sans même se voir [N° 4 duo « Quel murmure charmant »]. Une suivante vient chercher la princesse. De son côté, l’étudiant Sparck tente toujours d’entraîner Fantasio dans la ronde folle. Mais soudain passe sur la place le cortège funèbre et lugubre du bouffon Saint Jean. Fantasio a alors l’idée de prendre l’apparence et l’emploi du bouffon défunt, afin de pouvoir accéder aux genoux de la princesse [N° 5 chœur de pénitents « O Saint-Jean »]. Avec Sparck, il entre dans la boutique du tailleur proximité pour obtenir son nouveau costume. Voilà par la même occasion un bon moyen d’échapper à ses créanciers et à la prison. Survient le prince de Mantoue en compagnie de Marinoni. Désireux de découvrir les véritables sentiments de sa future épouse, le prince décide de se présenter à elle sous les habits de son aide de camps, ce dernier étant sommé de revêtir à son tour le costume princier [N° 6 duo « Je médite un projet d’importance »]. Les étudiants reviennent et Sparck de chanter un dernier hommage à Saint-Jean et aux fous en général. Tous attendent Fantasio mais sont saisis de stupeur à son arrivée, croyant voir le bouffon du roi ressuscité. La joyeuse bande s’éloigne. Fantasio resté seul frappe à la porte du palais [N° 7 finale « Tout bruit cesse »]. [N° 15 entracte] Enchanté d’avoir ruiné les plans de mariage du prince, Fantasio croupit pourtant en prison. Alors qu’il fait semblant de dormir, Elsbeth vient lui rendre visite [N° 16 romance « Psyché, pauvre imprudente »]. Elle confie à son nouveau bouffon que son acte de bravoure a été inutile et que de toute façon, elle se mariera avec le prince de Mantoue afin de maintenir la paix entre les deux royaumes. Fantasio enlève soudain son déguisement et chante sa sérénade du premier acte. Saisie, Elsbeth croit comprendre qu’il s’agit du vrai prince de Mantoue. Elle est prête à s’offrir à lui. Mais Fantasio révèle son identité : Fantasio, simple bourgeois de Munich et amoureux. [N° 17 duo « Il n’est qu’un refrain à chanter »]. Elsbeth lui confie alors la clef de son jardin et l’aide à s’échapper. Les gardes suisses ayant pour mission de tenir sous les verrous un bouffon bossu et non un charmant jeune homme, celui-ci qui sort librement en compagnie de la princesse [N° 18 mélodrame – entracte]. Au second tableau, nous revoici dans le même décor qu’au premier acte. Toujours ivre de rage, le prince s’apprête à pénétrer dans le palais royal afin de dire son fait au roi de Bavière, et reprendre à Marinoni ses attributs princiers [N° 19 couplets « Reprenez cet habit mon prince »]. Fantasio lui aussi a retrouvé ses habits (d’étudiant) et tente d’apaiser la colère de ses amis qui s’apprêtaient à le faire sortir de la prison [N° 20 scène et chœur « Ils sont entrés dans le palais »]. Pendant ce temps, le roi de Bavière et le prince de Mantoue se préparent à déclarer la guerre. Nommé roi des fous par les étudiants, Fantasio plaide pour la paix et provoque le prince en duel afin de régler le conflit sur le champ. Mais le prince recule, renonce au mariage avec Elsbeth et retourne à Mantoue. Fantasio, gracié par le roi, est fait prince pour avoir évité la guerre. Il offre à Elsbeth de lui rendre la clé des jardins qu’elle lui avait donnée en prison, mais elle le prie de la garder… [N° 21 finale « Sous ta bannière on se rallie »].